Autoimmune Brain disease or "AIBD" consists of a syndrome of central nervous system which is caused by antibodies or immune cells which are attacking the brain. There is considerable overlap between autoimmune disorders that attack the ear and those that attack the brain. There is also overlap between paraneoplastic syndromes, as many of these are mediated by the immune system. The immune system is complex and there are several ways that it can damage the brain. These include Systemic Lupus Erythematosus (SLE), Sjoegren's syndrome (dry eye syndrome), the antiphospholipid antibody syndrome, Wegener's granulomatosis, and rheumatoid arthritis. There are are also organ specific disorders such as Hashimoto's thyroiditis and Celiac disease (sprue) which occasionally are accompanied by AIBD. In Celiac disease, antibodies have been found directed against transglutamase 2 (an autoantigen in the gut), and transglutamase 6 - an antigen independent of intestinal involvement (Hadjivassilou M, et al, 2008). Antibodies to glutamate receptors have been reported in cerebellar degenerations (Gahring et al, 1997), in patients with downbeating nystagmus (Antonini et al, 2003), and palatal myoclonus. Antibodies to Gq1b (a ganglioside largely found in nerves), have been reported in a group of disorders including Guillain Barre, Bickerstaff's encephalitis, Miller-Fisher syndrome. Antibodies to GAD are also reported in "stiff person syndrome", typified by muscular rigidity and episodic muscle spasms. Anti-GAD antibodies are also very common in diabetes. Limbic encephalitis has been reported secondary to GABA-B receptor antibodies (Hoftberget et al, 2013). Cerebellar ataxia as well as opsoclonus has also been reported in persons with GABA-B antibodies. Autoimmune mechanisms have also been suggested for the opsoclonus-myoclonus syndrome (Pranzatelli 1996; Lapenna, Lochi et al. 2000; Dale 2003; Pranzatelli, Travelstead et al. 2004; Pranzatelli, Tate et al. 2005). Some of these are associated with tumors (i.e. neuroblastoma), making them also a paraneoplastic disease. Recently (2010), a new disorder called "CLIPPERS" Chronic lymphocytic inflammation with pontine perivascular enhancement responsive to steroids was described by Pittock et al. This disorder consists of an MRI pattern of blood vessel enhancement of the pons, combined with a variety of pontine symptoms -- facial paresthesia, diplopia, dysgeusia, and ataxia, and response to steroids. (Pittock et al, 2010). It points out the value of trying steroids in mysterious CNS disorders with signs of inflammation. We ourselves as well as most neuroradiologists attribute MRI like this to vascular malformations. It is possible that some of these cases actually have CLIPPERS (it would probably take an autopsy to be sure). Balzabal-Carvello and Jancovic reviewed "Movement disorders in Autoimmune Diseases (2012). They listed Sydenham's Chorea and Pandas as examples of movement disorders associated with Streptococci. Pandas is an acronym for pediatric autoimmune neuropsychiatric disorder associated with streptococcal infection. Click to find a discussion of this new entity. How common is autoimmune brain disease ? AIBD is rare, probably accounting for less than 1% of all cases of central disturbances. What causes autoimmune brain disease ? The cause of AIBD is generally assumed to be related to either antibodies or immune cells that cause damage to the brain. There are several theories as to how these might arise, analogously to other putative autoimmune disorders. It is also possible that they don't "cause" the problem, they are just associated with it. Or in other words, a positive test shows that there is an inappropriate immune response, but doesn't necessarily mean that it is causing a particular disease. Mistaken identity: Just because there is a positive blood test in a particular disease, does not imply that one causes the other. It might just be a coincidence (perhaps the case with Gluten sensitivity and Hashimoto's encephalitus, as these are conditions associated with extremely common auto-antibodies). Or there might be a common underlying cause of both the antibodies and the disease. This has been suggested to be the situation for the "classic paraneoplastic antigens", as in animal models, these antibodies seem to be innocuous (Balzabal-Carvallo and Jancovic, 2012). Examples of antibodies in the "mistaken identity" class include Anti-Yo, anti-Tr, anti-Ri, and anti-Hu. In other words, the "classic" paraneoplastic antibodies, don't seem to "cause" anything. On the other hand, there are also antibodies that are directed against cell-surface antigens. There is good evidence that these antibodies cause disease. These include VGKC antibodies, and NMDA-R antibodies. The NMDA-R syndrome is associated with teratomas primarily, and these patients respond to removal of the tumor. Thus these are also paraneoplastic disorders. According to Bertolini (2016), anti-NMDAR encephalitus is "now recognized as one of the most common forms of encephalitus". This dubious statistic came from a study of "young individuals" enrolled in the "California Encephalitis Project" -- i.e. it is likley not true in older people or in other parts of the world where there is more infectious encephalitus -- such as places with Zika virus. NMDA-R associated encephalitus acts like other types of encephalitus -- there is changes in behavior, mild changes in the spinal fluid, may have seizures and movement disorders. For NMDA-R (unlike the situation with the opsoclonus-neuroblastoma syndrome), symptoms may regress rapidly once the teratoma is removed. These patients are treated with the usual mixture of high-dose steroids and chemotherapy drugs -- such as IV methylprednisolone for 5 days and rituximab. Oddly, they do not get better with benzodiazepines. As an example of aggressive treatment, according to Bertolini (2016), "treatment of anti-NMDAR encephalitus consists of supportive measures, immunotherapy, and tumor removal. First line is generally high-dose steroids, immunoglobulin (IVIg) and plasma exchange. Rituximab and cyclophosphamide are usually considered second-line treatments and reserved for those patients who fail the first line." There is some reason to this as the first 3 treatments are unlikely to be lethal by themselves. Rituximab and cyclophosphamide are "sharp instruments" that can cause damage. Other pathogenic antibodies are thought to be glycine receptor antibodies causing PERM (progressive encephalophy, rigidity and myoclonus). Hashimoto's encephalitis is also thought to be steroid responsive, suggesting that the antibodies are toxic, although the antibodies associated with Hashimotos are very common. Bystander damage: In this theory damage to the brain causes cytokines to be released which provoke, after a delay, additional immune reactions. This theory might explain the attack/remission cycle of disorders such as multiple sclerosis. Cross-reactions: In this theory, antibodies or rogue T-cells cause accidental brain damage because the brain shares common antigens with a potentially harmful substance, virus or bacteria that the body is fighting off. 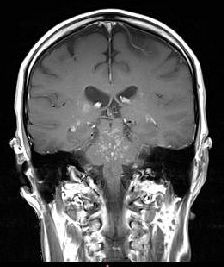 Intolerance: The brain, like the eye may be only an partially "immune privileged" locus, meaning that the body may not know about all of the brain antigens, and when they are released (perhaps following surgery or an infection), the body may wrongly mount an attack on the "foreign" antigen. In the eye, there is a syndrome called "sympathetic ophthalmia", where following a penetrating injury to one eye, the other eye may go blind. This theory is not presently in favor for the AIBD. It may account for some cases of autoimmune inner ear disease (AIED) hosever. Genetic factors: There is increasing evidence that genetically controlled aspects of the immune system may increase or otherwise be associated with increased susceptibility to brain injury. How is the diagnosis of autoimmune brain disease made? The diagnosis is based on history, findings on physical examination, blood tests, and the results of other tests. NMDAR encephalitus is diagnosed by finding NMDAR antibodies in the CSF (i.e. with a spinal tap). Frequently it is surmised that a condition is autoimune because it gets better after a specific treatment. anti-gliadin and anti-endomysial antibodies (for Celiac disease). How is Autoimmune Brain Disease Treated ? There are several protocols for treatment. In cases with a classic rapidly progressive impairment, a trial of steroids (Prednisone or Decadron) for 4 weeks may be tried. In persons with response to steroids, in most cases a chemotherapy type of medication such as Cytoxan or Methotrexate will be used over the long term ). Plasmapheresis or IVIG (immunoglobulin infusion) may be beneficial. Newer medications are constantly being developed for immune suppression, usually aimed at tumors related to the immune system. Rituximab is now commonly combined with steroids in individuals where one is mainly treating the immune response. Autoimmune brain disease is rare making it difficult to study. One can speculate that there might be effective treatments that simply have not been discovered. For example, there are numerous potential treatments that have not been tried in a formal way. Gamma globulin infusions, given monthly, is useful in numerous autoimmune disorders. This treatment is very expensive, which limits its use. Immune modulating drugs such as are used for treatment of MS (beta-interferon, alpha-inteferon, copaxone) are commonly used. Rituximab has been used in opsoclonus where the eyes move too fast, as well as Miller-Fisher syndrome where the eyes don't move at all (go figure). Other medications that have coincidental suppression of immune responses, such as minocycline, might be tried. Baizabal-Carvallo, J. F. and J. Jankovic (2012). "Movement disorders in autoimmune diseases." Mov Disord 27(8): 935-946. Dalmau, J., et al. (2007). "Paraneoplastic anti-N-methyl-D-aspartate receptor encephalitis associated with ovarian teratoma." Ann Neurol 61(1): 25-36. Gable, M. S., et al. (2012). "The frequency of autoimmune N-methyl-D-aspartate receptor encephalitis surpasses that of individual viral etiologies in young individuals enrolled in the California Encephalitis Project." Clin Infect Dis 54(7): 899-904. Hoftberger, R., et al. (2013). "Encephalitis and GABAB receptor antibodies: novel findings in a new case series of 20 patients." Neurology 81(17): 1500-1506. Jarius, S., et al. (2013). "GABAB receptor antibodies in paraneoplastic cerebellar ataxia." J Neuroimmunol 256(1-2): 94-96. Pranzatelli, M. R. (1996). "The immunopharmacology of the opsoclonus-myoclonus syndrome." Clin Neuropharmacol19(1): 1-47. Pittock, S. J., J. Debruyne, et al. (2010). "Chronic lymphocytic inflammation with pontine perivascular enhancement responsive to steroids (CLIPPERS)." Brain 133(9): 2626-2634. Pranzatelli, M. R., E. D. Tate, et al. (2005). "Immunologic and clinical responses to rituximab in a child with opsoclonus-myoclonus syndrome." Pediatrics115(1): e115-9. Pranzatelli, M. R., A. L. Travelstead, et al. (2004). "B- and T-cell markers in opsoclonus-myoclonus syndrome: immunophenotyping of CSF lymphocytes." Neurology62(9): 1526-32.